Successful innovation cannot be approached as a goal to strive for or as a simple metric to benchmark against. It can only be understood through a careful evaluation of what makes an organisation unique, which is hard, as everything is about people’s perception, and therefore both quantitative and qualitative descriptions are necessary before you can find the right insights and make the right decisions. 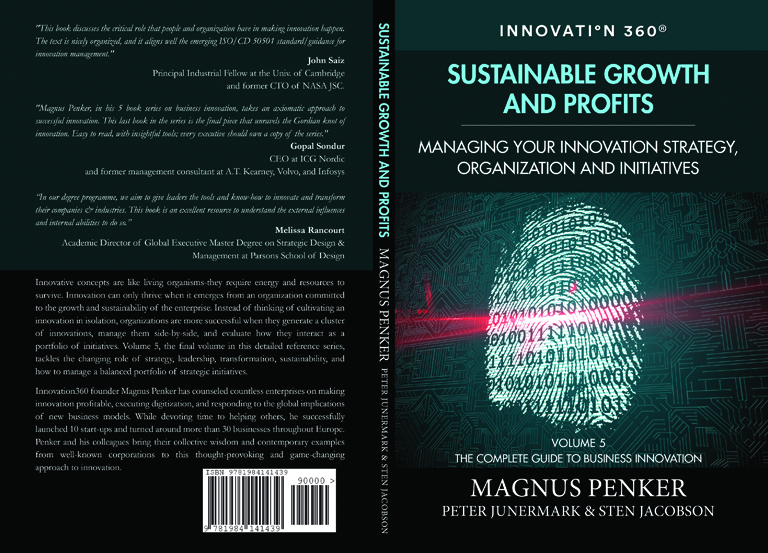 Magnus Penker’s insights into the elementary nature of innovation form the heart of the Innovation 360 Group’s methodology, and he continues to push the boundaries of the possible. The analytic tool InnoSurvey and his conclusions are not just theoretical but immensely practical. To prove his insights and theories, he launched 10 start-ups and has acquired, turned around and sold more than 30 enterprises. Today InnoSurvey is a globally used and leading analytic tool. Its databases of innovation management data are from more than +1,000 organizations in 62 countries. Presentations by Penker on topics like the Three Innovation Horizons place him out on the forefront of global thought leadership concerning the business implications of the radically new. This has made him a highly sought-after speaker at international business schools, associations, conferences and institutions around the world. In 2016, Penker was honoured to speak at the 8th Annual Drucker Forum, in Drucker’s home town of Vienna, Austria. The Global Peter Drucker Forum is an international management conference dedicated to the management philosophy of Peter Drucker, who lived from 1909 to 2005. Drucker was a management professor, writer and consultant, and was frequently referred to as a management guru. The forum is held annually in November, hosted by the Peter Drucker Society Europe and the Drucker Institute at Claremont Graduate University. 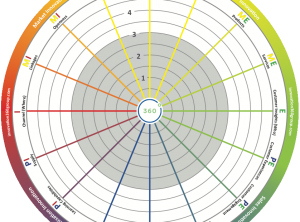 To engage with a wider audience, Innovation360 has codified Penker’s knowledge and insights, reaching out to the world through client assignments and licensed practitionersin 28 countries. As part of that outreach initiative, Innovation360 has partnered with global players, such as Internal Consulting Group, to bundle innovation with blockchain development, artificial intelligence, digitisation and brand reputation management. Penker and Innovation360 excel at simplifying the complexity of chaotic global markets where industries are being disrupted and reshaped at an unprecendented speed. In this, they guide businesses to devote resources to innovation, which complement and extend their core competencies as well as attract capital and talent to global innovation projects. By optimizing their competencies, the businesses’ hone their chance of redefining their own industries. Organizations of all kinds must innovate their way into future or get buried by the past. 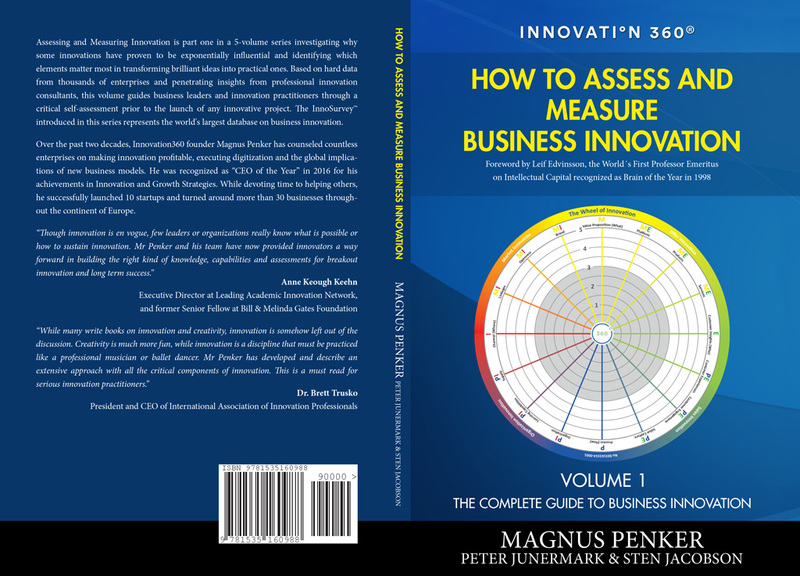 For more than a decade, Magnus Penker has been devoted to rescuing organizations by assessing their strengths and helping them implement their own unique innovation strategies. His Stockholm based consulting company Innovation360 works closely with global 100 executives in tech, finance, manufacturing, energy and some of the world’s largest funds. Governments and governmental bodies all around the world are using his methodology to lay the groundwork for a more sustainable future. He has been honored as Sweden’s ‘Most Innovative CEO 2016’ by Business Worldwide Magazine and was recognized as a ‘Global Top 100 CEO’ by CEO Monthly in 2018. Over the years, he has launched 10 start-ups and has acquired, turned around, and sold more than 30 SMEs across Europe. The Swedish-American Chamber of Commerce proudly invited top executives and influencers to this exclusive workshop held at the Swedish embassy in Washington DC in cooperation with the Swedish-American Chamber of Commerce, Magnus Penker and Peet van Biljon. Magnus Penker is a seasoned speaker, top consultant and awarded entrepreneur inspiring beyond what’s perceived as possible, that with an unparalleled level of energy, knowledge, and curiosity. As the CEO of Scandinavia’s largest association for entrepreneurs, I can recommend Magnus Penker as an inspirational speaker, facilitator and executive consultant for high-level assignments within the fields of innovation, artificial intelligence, and digitalization. Our members, the backbone of the Scandinavian hotbed of unicorns and tech companies, as well as Founders Alliance, appreciate and frequently engage Magnus as speaker, facilitator, and consultant for top level events. I acknowledge Magnus as the Scandinavian rising star of thought innovation and disruption leadership. We at CLOSE, one of Scandinavia’s leading executive network, have had the privilege of hearing the innovation-thought leader Magnus Penker lecture and inspire us at several of our chief executive meetings. Magnus is always prepared, and he always gives 110% of his effort. He is very professional with regard to executing a plan, and he goes beyond the call of duty to deliver the highest possible standards. He is an exceptional speaker with extensive knowledge of and personal experiences within the field of innovation and business transformation. Due to his genuine interest in helping businesses change and improve, he inspired participants in our meetings, giving them new insights that enabled them become more innovative and take new steps. He has received the highest ratings from our participants. Magnus is a great person to work with, and he always strives to create a good atmosphere and provide the best information for all stakeholders. Episode 002: How to ensure successful innovation: Kill zombies, and be brave!